Figure 1. 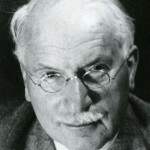 Psychologist Carl Gustav Jung. As discussed in a previous blog, the ego consists of the personal center of the psyche, however, C.G. Jung (Figure 1) conjectured the existence of another psychic center, a transpersonal one, which extends far beyond the ego’s sphere of influence. Jung called this transpersonal center the self, which not only is an archetype but simultaneously contains all archetypes. This produces a paradox that cannot be adequately articulated through syllogisms. The idea however seems aptly described via the dictum: “God is an intelligible sphere whose centre is everywhere and whose circumference is nowhere” (St. Bonaventure as cited by Jung, 1956/1963, CW14, para. 41). Figure 2. The earth has a geometric relationship with its star, the sun. Viewed psychologically, the self is the image of wholeness. It constitutes a psychic totality. The personality, afterall, is pluralistic. Although the ego feels as though it is all there is, in actuality the ego is only one psychic complex among many. As a psychologist, Jung conjectured that the psyche contains an a priori imprint of the god-image whose various manifestations (i.e., archetypal images) can be found in the world’s many religious systems. Edward Edinger (1972/1992), one of the best explicators of Jung’s ideas, wrote that “The Self is the ordering and unifying center of the total psyche (conscious and unconscious) just as the ego is the center of the conscious personality” (p. 3). 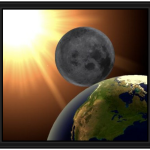 The ego is subordinate to the self in a way similar to the way the earth is subordinate to the sun (figure 2).In fact, the entire solar system could be viewed as a symbolic parallel to the human personality. To confuse the ego with the self can have an adverse effect on the personality. Often a situation arises where the naïve ego identifies with the self and becomes inflated. An inflated ego can produce an unrealistic and distorted view of his or her role in the world. People tend to react to such a psychological condition very differently. In some it may result as a power drive that can be described as hubris whereas others will co-opt a fantasy that is best characterized as “the provisional life”—an attitude that is not rooted in the existential realities of the here and now. We have all encountered these kinds of people in varying degrees ranging from the annoying to the pathological; and sometimes even we find ourselves yielding to such an inflated attitude. In this way, consciousness should approach the self cautiously. The bible seems to articulate this point very well: “It is a dreadful thing to fall into the hands of the living God” (Hebrews 10:31). “The experience of the self is always a defeat for the ego” (Jung, CW14, para. 778). One need not make any metaphysical assertions here as we are describing an empirical concept that has its grounding in the psyche. It requires only a cursory survey the world’s religions to find numerous analogues of the archetype of wholeness in the form of the god-image. Jung (1951/1956) even wrote that “the self, on account of its empirical peculiarities, proves to be the eidos . . . behind the supreme ideas of unity and totality that are inherent in all monotheistic and monistic systems” (CW9ii, para. 65). The influence of the self usually becomes most evident during the second half of life after the ego has passed its zenith and begins to set. As a general rule, analytical psychologists accept that while the central purpose of the first half of life is to create a distinct boundary between ego and self, the second half of life requires a devaluation of the ego and a relationship with the self. 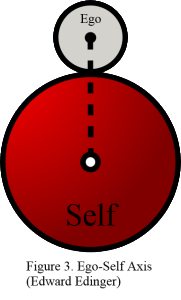 Edinger called the relationship between the ego and the self at the various stages of life the ego-self axis (Figure 3) (p. 5). The ego’s approach to the self, and the necessary relationship that gradually forms between the former and the latter, is essential to what Jung called individuation, a core Jungian idea we will explore in a subsequent blog. One could say that the process of individuation occurs when the ego relates to the self without identifying with it. Identification with the self can produce a whole range of psychological and existential problems. It is also necessary to point out that individuation is a life-long endeavor that one can only approximate but never fully achieve. For Jung saw the ego’s ultimate goal as wholeness. The ego’s knowledge of the self, however incomplete, could be viewed as a kind of gnosis that teaches us to acknowledge the objectivity of the psyche. I really enjoyed reading this blog. I think it make sense that the psyche, as you call it, has inborn imprint of what you call the archetype of wholeness or self. I wonder why Jung called it self. It is a little confusing because when I think of self I think of my own personality, perhaps even my identity. But I like what you say here. The more I read your blogs the better I seem to understand, though I admit that it is sometimes trying!! Minh, thanks for the response and question. I appreciate your inquiry. Yes, many of Jung’s concepts are innately intuitive, like the archetypes which he sometimes referred to as the “self-portraits of the instincts,” analogues if you will that have been conditioned by consciousness. Now, to your question regarding the self, you know, I can’t say for sure why Jung selected the word self to describe his concept of the archetype of wholeness or totality, although I did read somewhere that some early Jungians were not fond of the term. The idea of the self was largely inspired by the Hindu idea of the atman, which in Sanskrit roughly translates to inner self or soul. It could be viewed as a transcendent idea which accounts for the difficulty in articulating its meaning through a concept which can hardly do justice to its rich multivalent character. I hope that helps! Interesting article. I often wonder however if such an archetype exists. Hillman, as you likely know, de-emphasized the role of the self with his archetypal psychology, which suggests that every archetypal experience represents a legitimate center in the psyche in its own right. I wonder what Jung would say to that? Great article. As I read your past blogs, I get the sense that this is all building on the same basic ideas of a psychic reality. I would recommend that you try to dumb it down a little for the layperson, which I definitely am. The main image for this blog reminds me a lot of Jung’s paintings in the Red Book. Similar colors and the use of symmetry. I can’t help but think your company logo is also playing off of the same colors. Julius, Thanks for the note. 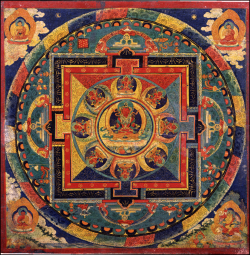 The Tibetan mandala that I added as the title image is reminiscent of some of the paintings in Liber Novus (The Red Book). In fact, the colors suggest Jung’s typology which may be understood via the following rubric: blue = thinking, red = feeling, yellow = intuition, and green = sensation. The company logo you see on the main website intends to convey this very idea, individuation via synchronization of the types, and proper knowledge of the unconscious (lunar crescent). Great comment. Very interesting. Like other commenters mentioned, the ‘self’ seems to be a more complex idea to understand (presumably because of the misnomer stemming from our preconceived idea of what the ‘self’ is in our everyday conversational lingo as opposed to Jung’s usage). A simplistic aid that helped me understand the concept (which I read previously and can’t quite remember where) goes something like this; picture the self as the whole orchestra of talented musicians and a skillful conductor, which picks the best pieces to play from a wide volume of music and ability, while the ego is the manager of sorts, taking care of the logistical support and ability to ‘put on the show’. You have a knack for breaking it down so we can understand it. Thanks for another good one my friend. Paracelsus, Thank you for the comment and the metaphor that you broached is very helpful. The concept of the self is wide-ranging and multivalent so it is really difficult to say anything definitive about it because of what seems to be its transpsychic origins.